For Women Over 40 Only! or the saggy knees because we are no longer running a marathon after our kids all day long. No matter how many sit-ups you do, those muscles just will not go back to where they are suppose to be. Starving yourself hasn't helped, and neither has all of the sit-ups you have been doing. It just seems like no matter what you do, you just keep getting bigger around the middle instead of smaller. Well, guess what? You are. When you starve yourself, your body can’t tell if you are doing it intentionally to lose weight or if you are truly starving. When you do any type of fasting, or lower your caloric intake for any length of time, your body automatically slows down it's metabolism and begins storing your body fat so that it can be used as an energy source when needed. Instead of burning the fat off, your body will automatically begin feeding on lean muscle. When you first begin a diet of any kind, and cut caloric intake, the amount of weight that you lose is not really body weight at all, but simply water weight and unfortunately the lean muscle mass that I just mentioned. Because of this complete slow down of your metabolism, once you begin eating again, your body has a rebound effect which adds even more pounds on than you had before, thus the "yo-yo" effect we are all so familiar with. The only way to permanently get rid of those fat stores in the body, is to burn more calories than you are taking into it and you must boost your metabolic rate in order to do this. Yes, you still do need to exercise, but you also need to make changes in not only what you eat, but the way you eat too. 1. Stop eating sugar and drinking sodas. American food manufactures are notorious for putting sugar into everything we eat that is processed. Sugar is highly addictive and the more we ingest the more we want. Holy Christmas! McDonald's even adds sugar to their french fries. Start reading all of your food labels. If it has sugar, brown sugar, high fruitose, high fructose, high fructose corn syrup, sucrose, lactose, molasses, honey, corn syrup, caro syrup, or any derivitives of the above, they are all sugar. 2. Cut out all of the white flour products. Eating white flour products is really eating empty calories. All of the wheat bran and wheat germ has been removed and those are the parts that you body needs. You will also notice when you start reading your labels, that anything made with white flour also contains more sugar that it's whole grain counter products. 3. Switch from eating white rice to brown rice. As with the white bread versus the whole grain bread, the fibrous hull and the rice germ has been removed from the rice grain. The rice is then polished with talc to bring you white rice. Again, you are eating empty calories. 4. Instead of eating 1 to 3 humongous meals a day, start eating 5 to 6 small, high quality, nutritious meals a day. A meal can be anything from a nutritious snack (no, not one of those "so called" protein bars that are full of sugar - I said, "nutritious") to a smaller sit-down meal. Eating this way will greatly increase your metabolism, which in turn will burn more calories for you. 5. Getting a full 8 hours of sleep every night is also crucial to losing weight. You body needs the sleep not only to replenish and restore brains cells, it also needs sleep to restore the body and believe it or not, burn calories! These are just a few of the small steps that will make a huge difference in not only your health, but your weight and exercise program. I recently discovered a new life changing package that was designed for all of us that are over 40 and have so much information over-load on what works and what doesn't that we don't know where to turn. This package is the best that I have seen for women like us, that are over 40 or even over 50. It is packed full of information on what to do to get back in to shape and look like you did 10 years ago. I have studied nutrition and alternative medicine for over 30 years and this is the best program that I have seen in a while that is targeted to women our age. It addresses the way most American women eat, the life styles that we live, the changes our bodies go through at this age, and shows us how to overcome these obstacles. Christopher Warden, a New York City celebrity fitness trainer, has put together an amazing package deal that works. It comes with a 100% guarantee and you are not going to believe how reasonable it is. Christopher could easily charge three times more than he is. It is like hiring a personal trainer, except that you won't be paying up to $250 an hour. This is not an e-book! This Is A Fully Supported Coaching Program that Uses a Natural and Holistic Approach To Deliver Health As a Foundation For Optimal Fitness For The Busy Women Over 40. What is 'Women's Fitness Beyond 40? Women's Fitness Beyond 40 is a complete holistic system that works on the inside and out to transform women over 40 into into women that look and feel at least 10 years younger. The guide essentially works on a woman's mental, emotional, and physical health. Instead of counting calories (which we all know is destined for failure) it works on the complete health of the woman. You are instructed on how to eat, what to eat and when to eat it, all according to the need of the individual. Nothing is left to chance, nor are you left alone to try to figure it out for your self as Christopher provides complete support. 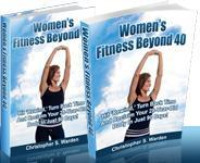 The Women's Fitness Beyond 40 holistic system is based on 5 elements called the basic 5 fundamentals that are 3 parts mental and emotional, and 2 parts physical. The elements that Christopher uses, are the bases for transforming women just like you into slimmer, more beautiful, and healthier women, while creating a foundation of of holistic health with the doorway to success. ➢ A proven strategy to help you clearly define your goals and actually see them realized. ➢ A simple, natural approach – using nutritious whole foods as the ‘medicine’ -- to detoxify and gently cleanse your body from the inside-out, helping you to strip fat and look and feel your best all the time. ➢ A long term eating plan that flies in the face of traditional ‘healthy’ eating plans and maximizes fat loss, fitness, health and longevity. ➢ A complete exercise regimen, including pictures and videos, that is effective and efficient at firming you up and improving your performance in only 30 minutes per day. ➢ A community website, packed with information and a supportive forum network of your new closest friends . . . all aimed at helping you to maximize your fitness potential. ➢ Support throughout the 90-day program with emails that coach, motivate and hold you accountable to your goals. One of the many things that I love about Christopher's support program is the website. He has provided a social place for the women using his program to share their concerns and successes. It is set up similar to Facebook where you can join groups or start your own group, if you prefer. Christopher frequents the site providing help and encouragement, which is such a huge form of support that you don't get when purchasing just an e-book or a set of videos. This is an amazing program for all women that have reached 40, or beyond, that have realized they need help with their overall health for both a mental and physical makeover. Have a look at Christopher's brand new coaching program. I know you will be as impressed as I am by the program Christopher is offering. The program is worth so much more than he is charging, I just cannot see how he can keep up the pace for this low price for very long. I am sure he will be raising the price as soon as the word gets out about this awesome program. Women's Fitness Beyond 40. If you are sick and tired of feeling sick and tired, and just plain worn down; if you are disgusted with what you see every time you look in the mirror; if you are confused by what healthy nutritional food you should be eating; then Women's Fitness Beyond 40 is exactly what you have been looking for. You can save your life and get back your youthful energy; you can be the most vibrant, full of life, slimmer, and most beautiful woman, you have ever been by joining Women's Fitness Beyond 40 today!